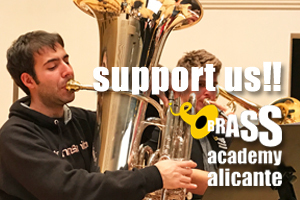 The “Brass Academy Alicante” was created in September 2008 and in parallel with the pedagogical activities, created an ensemble of metals with the best students of the Academy, which aims to play quality works of diverse periods and styles and doing so creating a known repertoire to the students of the capable technical level. Currently the group consists of 6 trumpets, 4 horns, 3 trombones, a bass trombone, a euphonium and 1 tuba. When the ensemble requires so, it enlarges the group with other members of the Academy. The directing is in charge of the Rudi Korp, professor of trumpet Brass Academy. The Ensemble has had performances in Callosa de Segura, Torrevieja, Orihuela, Murcia, Cox, Villena, Calpe, Benissa, Alicante ADDA Auditorium,Villajoyosa, Altea Palau, Barcelona, Schagerl Festival in Austria and Madrid.